As a trusted source for real-time hail data for roofers and contractors since 2011, Live Hail Reports’ newly re-designed site is now easier to navigate with additional product offerings, including Hail Swath Maps which show color coded geographic areas impacted by hail. Live Hail Reports is a must-have for contractors or anyone who repairs hail damage and needs to get to the worst affected areas first. “Roofers and contractors will benefit from our new Hail Swath Maps which provide an easy-to-read and color coded bullseye view of hail damage,” said SWIFT Weather CEO Rory Groves. The award-winning weather software developer, SWIFT Weather, today announced their newly re-designed website – Live Hail Reports – and the launch of their newest hail map product for roofers and contractors – Hail Swath Maps. As a leading provider of hail maps, the site’s new Hail Swath Maps not only show hail storms by region throughout the United States, but also plot hail paths across geographic areas and color code them in quarter-inch increments from ¾ inch up to 4+ inch hail. Integrated storm reports show exactly where the hail damage has occurred. Individual Hail Swath Maps are $99 each. The new site is extremely user friendly and intuitive, allowing the user to select their desired geographic area from an interactive map. The user can browse by single or multiple states, date and five classes of damage: Light Hail Damage, Light to Moderate Hail Damage, Moderate to Heavy Hail Damage, Heavy and Widespread Hail Damage, or Significant and Widespread Hail Damage. Recent Hail Swath Maps indicating areas of new activity also are offered throughout the site. For unlimited access to Hail Damage Reports, roofers and contractors can choose from three subscription plans – Standard ($79/month), Plus ($129/month) and Pro ($199/month) – allowing users choose the hail tracking features which meet their exact needs. Depending on the monthly plan selected, users can review hail damage patterns using real-time hail reports for any state in the country; obtain access to a vast historical data archive, hail damage reports and maps, and aerial photography. Live Hail Reports is a must-have for contractors or anyone who repairs hail damage and needs to get to the worst affected areas first. 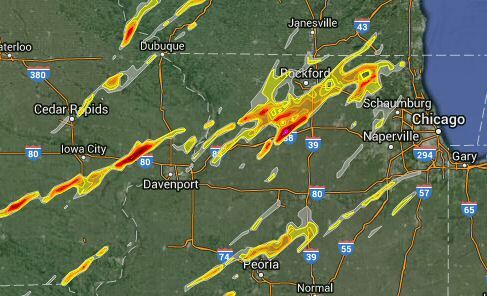 Visit http://livehailreports.com for more information or to get Hail Swath Maps or Hail Damage Reports today. Hail Swath Maps not only show hail storms by region throughout the U.S., but also plot hail paths across geographic areas and color code them in quarter-inch increments from ¾ inch up to 4+ inch hail.